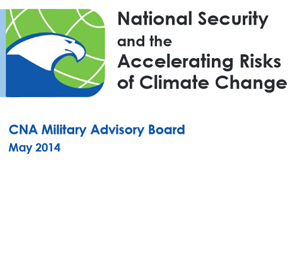 In 2007 a US military advisory board issued an important report into climate change and national security. It identified a changing climate as a major challenge to future stability, either multiplying existing threats or even sparking new conflicts. Ever since, the military has been among the most progressive actors on climate change in the US government. The rest of the country may not be taking it seriously, but the military is. This month the panel have released an updated report, confirming their initial findings and warning that climate change is a clear and present danger. “Climate change is no longer a future threa – it is taking place now.” Seeing their role as risk management as much as anything, they are quite clear that uncertainty is inevitable, but is no excuse. “Speaking as a soldier,” says one general, “we never have 100 percent certainty. If you wait until you have 100 percent certainty, something bad is going to happen on the battlefield. Among the various risks, the report identifies the changing geopolitics of the Arctic, threats to coastal regions from rising sea levels, and the water-food-energy nexus as the world keeps pace with a growing population. These things are not being considered seriously, they note, because climate change debate has become so politicised. As if to prove the point, the House of Representatives followed the report by passing an amendment banning the military from spending any money on addressing climate change. Apparently the Republicans’ passionate denial of climate change is more powerful than their love of its armed forces. We are dismayed that discussions of climate change have become so polarizing and have receded from the arena of informed public discourse and debate. Political posturing and budgetary woes cannot be allowed to inhibit discussion and debate over what so many believe to be a salient national security concern for our nation. Each citizen must ask what he or she can do individually to mitigate climate change, and collectively what his or her local, state, and national leaders are doing to ensure that the world is sustained for future generations. Previous Entry Is working from home a greener option?